Brian Miller would be 80… Garry Glitter did not sing at the Trump inauguration… stall on Todmorden market sells four candles and fork handles…Winnie the Pooh Day… brown toast is bad for you say experts…Game 200 for Sean Dyche at BFC… number 150 for Tom Heaton. All of us were desperate for the first away win. But: we were only playing Arsenal at the Emirates. 28 of us were on the Supporters Club coach travelling down for the weekend and our host now, and chief bottle-washer, was Mr Barrie Oliver following the retirement of the esteemed Haluks; custodians of the front seat (and tickets) for more years than they cared to remember. We travelled however, with high hopes, following all the recent good results and home wins, the immensely respectable 10th place and the 26 points leaving Burnley 10 points above the twilight zone. And not only that: the club hierarchy were showing real statements of intent and ambition with bids in place (we were told) for Brady at Norwich. This is a top player. The Venerable Arsene waxed lyrical about Burnley before the game. 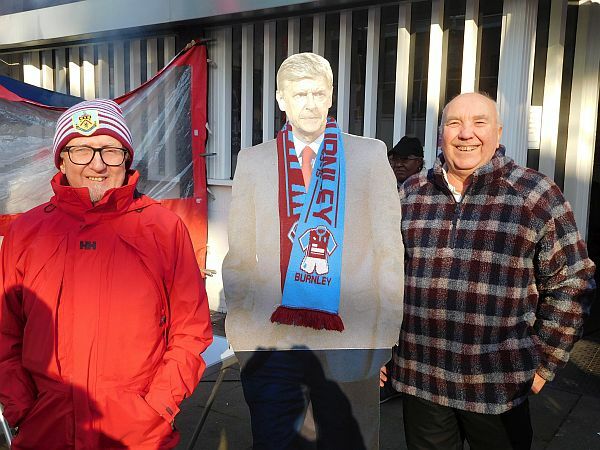 Unfortunately, the Venerable Arsene made a real arsene of himself during and after the game, as yet again Burnley lost to a 98th minute highly controversial goal after equalising themselves in the 93rd minute. It was therefore a sombre coach that journeyed home, crawling through Highbury and Highgate to the M1, after a performance that deserved the reward of a point and but for a dim linesman they would have certainly gone home with one. Why is it that the little teams suffer so often from decisions (or lack of them) like this? Until that 98th minute, what a weekend it had been in London. The coach trundled down on Friday whilst The Donald was installed as the 45th US President. The hair was immaculately impressive, never straying an inch from its carefully combed almost floral arrangement. The Blessed Hilary with husband Bill by her side looked on with a face like a bag of prunes. But, just round the corner demonstrators in masks and hoods re-arranged shop windows and set fire to cars. We meanwhile, pottered around Banbury in the cold sunshine and then de-camped to Wetherspoons for a warm. Banbury is such a sad place; it always feels like it ought to be a thriving tourist centre, buzzing with attractions, but take away M&S, W H Smiths and Wetherspoons and it would be totally asleep. Whilst The Donald up on the podium pecked Mrs Obama on the cheek with a delicate kiss, the coach was snarled up in tailbacks on the way into London. Close one traffic lane and the place grinds to a halt. Whilst we stuttered and lurched an inch at a time, The Don, newly crowned, went walkabout pretending that these were the biggest crowds ever. Hugh and Peter were unconcerned. Their eyes were firmly fixed on the 20+ Real Ale pubs they had earmarked for weekend visits. “From the front steps of the hotel, 20 are just a spit away,” Hugh explained. They actually visited 22; on the Saturday setting off from Highbury to the north and then meandering back south to the Thames. “Just a half pint in each,” Hugh further explained. If my maths is correct this is 11 pints each. The mind boggles. The Donald is apparently tea total and he’s a billionaire and the US President. Perhaps there is a moral in there somewhere. Trump, unexploded bombs in the Thames, test missiles flying off course, demonstrations, Brexit, were of no great concern to us however as we unpacked in the hotel and all of us planned our Saturday rambles into the city. The weather ideal, crisp, sunny, clear blue skies, just perfect for the Women’s Rights and anti-Donald rally and demo in Trafalgar Square that same Saturday afternoon. But tourists on the top decks of tour double-deckers looked frozen to the bone. We’d wandered via Trafalgar Square back to the hotel just minutes after the women’s rally had ended. The crowds were thick, litter and debris ankle deep; progress along the pavements was slow and in front of us, three young women battled their way through the milling pedestrians carrying a banner in lurid colours so offensive it was a wonder the three of them hadn’t been arrested. Let’s just say it had the F word in three different formats. Funny how things work out: By 5 o’clock the following day on Sunday I was thinking much the same as we exited the Arsenal stadium having been robbed of what would have been a terrific point. Every pundit and media expert was agreed that the Arsenal winner should never have happened and a hapless linesman was simply not doing his job. But like the girl in bovver boots, we didn’t want sympathy, just the point that we felt was rightly ours. We’d laughed and laughed at the Show we went to see on Saturday ‘Peter Pan Goes Wrong,’ two hours of slapstick and daftness a few streets away from the big demo. We weren’t laughing at The Emirates and 1500 Claret fans there seethed and fumed at the way things had turned out. Arsenal’s own fans and the hundreds if not thousands of ‘occasional’ one-game, tourist hangers-on were ecstatic of course. They knew they’d been in a game. They knew that Burnley had been mugged so that the roar they produced was as much relief as anything else. Wandering around the stadium before the game every other voice you heard was from overseas. The little café a few hundred yards away where we had a big breakfast the last time we went was gone, now a Spanish Deli. The number of street food stalls had doubled but none did Cowheel Pie. Other than the pure joy of watching and appreciating Sanchez, there is little to love about this current Arsenal side, a side that takes its lead from the pinch-faced and unpleasant Wenger. He’d said nice things about Burnley but then reverted to his normal self when things didn’t quite go his way and the goals didn’t pile up. His side had now beaten Burnley twice with the most dubious of last minute decisions and had they gone against his side we would have seen him incandescent and accusing refs of being cheats. Dyche meanwhile retained his dignity but if he’d kicked a few doors down back in the dressing room who could have blamed him. The events piled up through the game, the Sanchez trickery, Marney stretchered off, Xhaka red carded, Wenger jostling with the fourth official and sent to the stands (he’d called Moss a cheat), then Burnley’s equaliser in injury time, and then the sickening linesman error that led to Arsenal’s last minute penalty. With the win under his belt Wenger afterwards was almost amused by his own sending-off, grinning like a sheepish, naughty little schoolboy when quizzed. The first Arsenal goal had been gifted. Across comes the corner, Mustafi, a distance out, rises in clear space to head home and the ball heads for the far corner where there is no defender on the line. What a soft goal to concede bearing in mind the Herculean defending that had preceded it through the first half with Mee and Keane outstanding although every player rose to the occasion. Organised, tough, gritty, determined, courageous, all the usual qualities were there with Heaton making the saves when called on; and then to throw all that away with such lax marking. In the second half and Dyche brings Barton on (Arsenal boos totally expected), Tarkowski and then Vokes. The extra-time minutes had accumulated so that the number 7 went up on the screens. It was as if the fates were being kind to Burnley giving them the extra time to get some kind of result. No-one could possibly say that Burnley had come to shut up shop and park the bus, starting with two strikers. They ended with three and piled the pressure on. Into the last ten minutes, the game now breathless, the margin narrow and the hope growing for some kind of divine intervention. Nothing divine at all about it, just Coquelin rashly upending Barnes in the box. In truth we were astonished to see Moss pointing to the spot. We’d got a big decision at last. Were we going to get a magnificent point? Gray strode up, blasted the ball and in it went; 1-1 and surely, we thought, that was that and we could play out the game. But little clubs and little teams, it can be argued, seldom get the rub of the green. And so it proved yet again. An Arsenal cross into the box has us screaming for the whistle, the ball slung over, Koscielny a clear foot offside, the linesman looking elsewhere, the cross deep and high, Koscielny goes up to head, Mee’s foot goes up to clear and the foot and head connect, or at least Koscielny clutches his face and falls dramatically. Mee is looking at the ball; Koscielny on his blind side, the linesman presumably had his blind eye closed when the cross came over, Moss decides penalty. We, at the other faraway end, are simply staggered and aghast. Football is cruel, so bloody cruel. It’s happened again, we moaned. We willed Heaton to perform the miracle and make the save. But Sanchez is cool and crafty and while Tom dives to his right, Sanchez gently plops the ball down the middle into the empty space and we hold our heads in a state of disbelief and denial before our howls of our rage mix with the jubilation of the equally disbelieving Arsenal fans. No doubt Wenger smirked an enormous smirk. Back in the good old USA, The Donald was insisting that his inauguration turn-out was the greatest ever. It was far from it. But his claim wasn’t a lie; lies and untruths can be seen as ‘alternative facts,’ an aide said. We’d witnessed our own ‘alternative facts’ at The Emirates. An offside goal was deemed not offside and Wenger in ‘alternative fact’ had not jostled the fourth official, he said afterwards with a gentle smirk. Given the chance perhaps Mrs T and me might have nipped back to St Paul’s to say a prayer for an away win and light a candle. Our Saturday walking tour of the city had taken us past it from the hotel. We’d headed inside and saw it was £18 to go in – each. Astonished, with a 180 degree smart about turn at pace that would have been a credit to little Sanchez we exited the building. 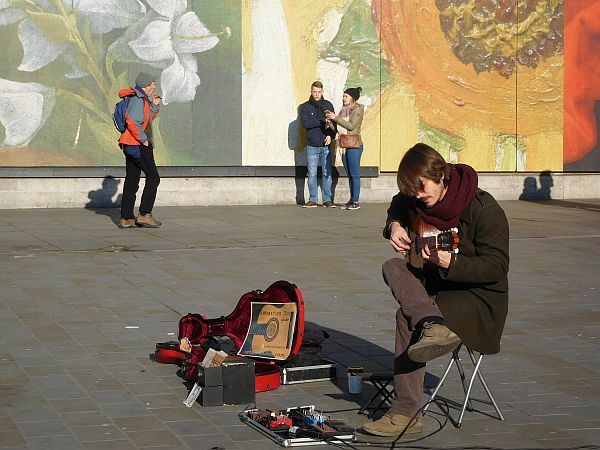 Ludgate Hill, Fleet Street, the Strand and onwards to Trafalgar Square we strolled where a Spanish guitarist filled the place with amplified perfection. The Art Gallery was free so in we went for a warm. Trust me, Van Gogh’s Sunflowers is a huge anti-climax in real life up close; but the Canaletto Venetian paintings are absolute masterpieces, the detail astonishing; you need to look at each of them for several minutes to take it all in. As we came out, the Spanish guitarist was competing with Michael Jackson hits, a ghetto blaster and street dancers. He was forced to surrender. Class replaced by crass. As indeed it was at Arsenal the following day. There was a time when this was a club that stood for what was good in the game. It was a side with its perfection passing football that you loved to watch. Now, it is a club that stamps its foot in pique when things don’t go to plan and a little team arrives and refuses to lie down. Within Wenger there is a meanness of spirit; he is almost a French version of Victor Meldrew. So: we left, still waiting for the first win, but in this game the scoreline was an unjust reward for a magnificent performance. No-one could ever say these Burnley players are blessed with sublime skills or blistering pace but playing to the absolute maximum of the strengths and talents they do have, they were just 30 seconds away from a deserved point. We’d seen a splendid pantomime on Saturday afternoon. In the last minutes of the Arsenal game, we thought we were watching another.